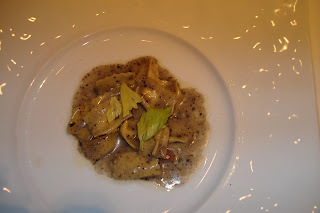 Agnolotti and truffle butter. This dish is sooo rich! 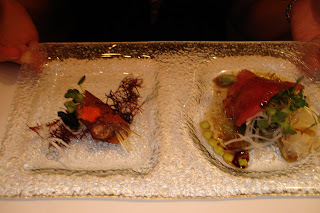 This picture doesn't really do these justice - it's the yellowfin tuna duo and it won raves from Jen! 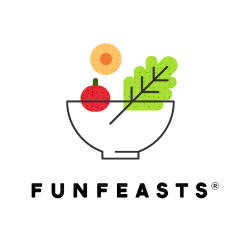 Definitely NOT your average soup and salad. 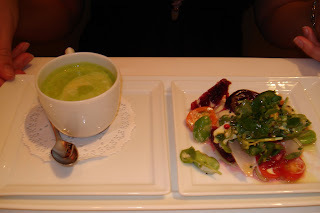 Green pea soup + beet, blood orange salad. 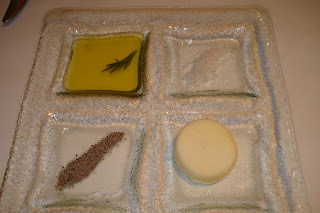 Check out the presentation: butter, olive oil, salt and pepper. Simple and oh, so elegant. We were on our way to Michael Mina but made a detour at the Forum Shops and ended up at Spago. My original thought was that this would be a standard dinner in a big name place. Wrong! I have to say the menu items were interesting, amazing and kept making me wonder “how did they make that?” A few noteworthy mentions: the green pea soup (I only had a small taste because it was on Jennifer’s tasting menu), the four cheese agnolotti (again, the black truffle butter theme here – yum) and the blue cheese crusted filet. I split the filet with my friend Beth and must say if I didn’t like her so much would have possibly arm wrestled her to the ground for the entire plate. However, I ate my “half” and then promptly ordered dessert (all the while still dreaming of the filet). Green pea soup. I can’t remember the exact name of this soup but it was a beautiful color with a rich pea flavor in a cream (?) base. Pizza Margherita- Mozzarella, Fontina, Parmesan, Goat Cheese with Garden Tomatoes and Basil. I am the "Jen" who ordered the tasting menu and wanted to add my two cents. First, the service at Spago's was exceptional. Second, I love the tasting menu. Great variety and choices. My favs were the pea soup, the fish "taco" and the agnolotti- I just wanted to lick the plate of the truffle butter. Last- having great friends around made this a truly memorable meal!